Home > Shop By Brand > Lake Country Buffing Pads > Lake Country Rayon 5 Inch Glass Cutting Pads 3 Pack > Dual-Action Hook & Loop Flexible Backing Plate 5"
5 inch molded urethane backing plate for excellent flexibility and balance by Lake Country MFG. If German car makers think this backing plate is good enough to use on their top-of-the-line vehicles, you can bet it is the best plate you can buy for your vehicle. BMW and Mercedes-Benz both hail these backing plates as the best because of the outstanding properties of molded urethane. These Dual-Action Flexible Backing Plates minimize heat transfer, flexes to hug your vehicle’s curves, and are built to last. 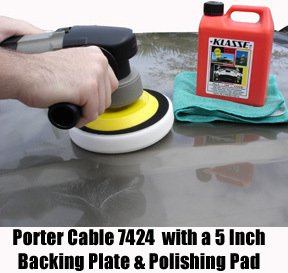 And they are the best backing plates you can buy for the Porter Cable 7424XP Dual-Action Polisher. Molded Urethane is where it’s at. This material is flexible yet incredibly durable. This plate will last through countless, rigorous uses without falling apart or becoming unbalanced. Balancing is essential when it comes to polishers because an unbalanced plate will bounce, leaving an uneven finish. The reinforced inner construction uses steel struts molded into the center hub to give the plate stability and maintain an even surface for your pad. Another benefit of urethane is its resistance to heat. The Flexible Backing Plate minimizes the transfer of heat from the motor to the paint to prevent burning. Spontaneous heat build-up is also reduced. Remove and replace pads easily from the hook & loop surface. The hook & loop is molded into the plate so it will not come off. The Flexible Backing Plate LC-43-125DA measures 5 Inches in Diameter and is perfect for pads up to 6 inches. This plate is great for the Porter Cable 7424XP because it has a generous edge. Even if you turn the pad onto its side accidentally, there is an inch of flexible, beveled urethane between the edge of the plate and the inner construction. The backing plate fits any polisher that accepts a 5/16” thread. Use the backing plate preferred by some of the leading car manufacturers in the world to put the final touches on their vehicles. Our Dual-Action Flexible Backing Plate provides the safest, most durable surface for your pads so that you get the best performance possible from your dual-action polisher. These backing plates are designed to fit most dual action polishers including the Porter Cable 7424XP, Meguiars G110v2 and the Griots Garage Random Orbital Polisher. You cant go wrong with lake country, there the best when it comes to backplates and buffing pads. ProsLow cost, strong construction, light weight, flexible, spins nice and straight, handles high speed operation well, minimal vobration. I bought this to use with my Porter Cable buffer and 6 inch sheepskin hook and loop buffing pads. The hook and loop holds fast and functions perfectly. As usual another great purchase from auto geek. Thank you very much! Very nice plate flat and feels solid. Ordering was nice and fast. Perfect replacement for my dual action polisher. Already polished my 36 ft. Motorhome.